Selecting the right enterprise resource planning (ERP) software often poses a challenge for many businesses in the manufacturing industry. With so many options out there, it’s difficult to break down each potential application and choose the one that’s the best fit for your business. 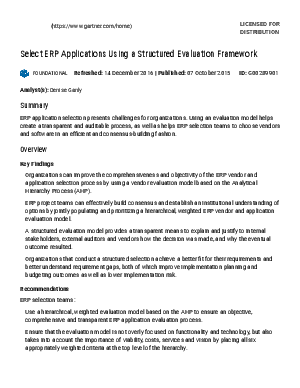 This Gartner report explains how ERP selection teams can come to a consensus and establish an understanding of all options by jointly populating and prioritizing a hierarchical, weighted ERP evaluation model. A structured evaluation model helps put all the cards on the table by explaining and justifying to internal stakeholders, external auditors, and vendors how and why an ERP software decision was made. According to the report, organizations that conduct a structured selection achieve a better fit for their requirements and better understand requirement gaps—both of which improve implementation planning and budgeting outcomes as well as lower implementation risk. Read the Gartner report and establish your own ERP evaluation model to see if an Epicor ERP solution might be the right fit for your manufacturing business.